New comprehensive mapping of the radiation pummeling Jupiter's icy moon Europa reveals where scientists should look—and how deep they'll have to go—when searching for signs of habitability and biosignatures. 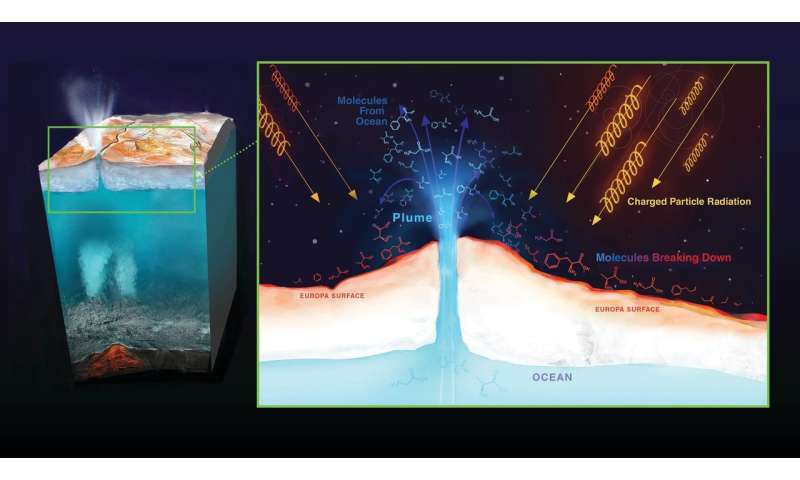 Since NASA's Galileo mission yielded strong evidence of a global ocean underneath Europa's icy shell in the 1990s, scientists have considered that moon one of the most promising places in our solar system to look for ingredients to support life. There's even evidence that the salty water sloshing around the moon's interior makes its way to the surface. By studying this material from the interior, scientists developing future missions hope to learn more about the possible habitability of Europa's ocean.However, Europa's surface is bombarded by a constant and intense blast of radiation from Jupiter. This radiation can destroy or alter material transported up to the surface, making it more difficult for scientists to know if it actually represents conditions in Europa's ocean. As scientists plan for upcoming exploration of Europa, they have grappled with many unknowns: Where is the radiation most intense? How deep do the energetic particles go? How does radiation affect what's on the surface and beneath—including potential chemical signs, or biosignatures, that could imply the presence of life. A new scientific study, published today in Nature Astronomy, represents the most complete modeling and mapping of radiation at Europa and offers key pieces to the puzzle. The lead author is Tom Nordheim, research scientist at NASA's Jet Propulsion Laboratory, Pasadena, California. "If we want to understand what's going on at the surface of Europa and how that links to the ocean underneath, we need to understand the radiation," Nordheim said. "When we examine materials that have come up from the subsurface, what are we looking at? Does this tell us what is in the ocean, or is this what happened to the materials after they have been radiated?" Using data from Galileo's flybys of Europa two decades ago and electron measurements from NASA's Voyager 1 spacecraft, Nordheim and his team looked closely at the electrons blasting the moon's surface. They found that the radiation doses vary by location. The harshest radiation is concentrated in zones around the equator, and the radiation lessens closer to the poles. "This is the first prediction of radiation levels at each point on Europa's surface and is important information for future Europa missions," said Chris Paranicas, a co-author from the Johns Hopkins Applied Physics Laboratory in Laurel, Maryland. Now scientists know where to find regions least altered by radiation, which could be crucial information for the JPL-led Europa Clipper, NASA's mission to orbit Jupiter and monitor Europa with about 45 close flybys. The spacecraft may launch as early as 2022 and will carry cameras, spectrometers, plasma and radar instruments to investigate the composition of the moon's surface, its ocean, and material that has been ejected from the surface. In his new paper, Nordheim didn't stop with a two-dimensional map. He went deeper, gauging how far below the surface the radiation penetrates, and building 3-D models of the most intense radiation on Europa. The results tell us how deep scientists need to dig or drill, during a potential future Europa lander mission, to find any biosignatures that might be preserved. The answer varies, from 4 to 8 inches (10 to 20 centimeters) in the highest-radiation zones—down to less than 0.4 inches (1 centimeter) deep in regions of Europa at middle- and high-latitudes, toward the moon's poles. To reach that conclusion, Nordheim tested the effect of radiation on amino acids, basic building blocks for proteins, to figure out how Europa's radiation would affect potential biosignatures. Amino acids are among the simplest molecules that qualify as a potential biosignature, the paper notes. "The radiation that bombards Europa's surface leaves a fingerprint," said Kevin Hand, co-author of the new research and projectscientist for the potential Europa Lander mission. "If we know what that fingerprint looks like, we can better understand the nature of any organics and possible biosignatures that might be detected with future missions, be they spacecraft that fly by or land on Europa. Europa Clipper's mission team is examining possible orbit paths, and proposed routes pass over many regions of Europa that experience lower levels of radiation, Hand said. "That's good news for looking at potentially fresh ocean material that has not been heavily modified by the fingerprint of radiation."